Got a restaurant with a great rooftop? Lucky you! Not only is rooftop seating an appealing feature for restaurant-goers looking for a fun, outdoor dining experience, but it is also an ideal place to host private events.Marketing your restaurant’s rooftop seating is a smart way to win new customers, but you’ll want to make sure you and your restaurant staff are fully prepared to show guests a good – and safe – time. 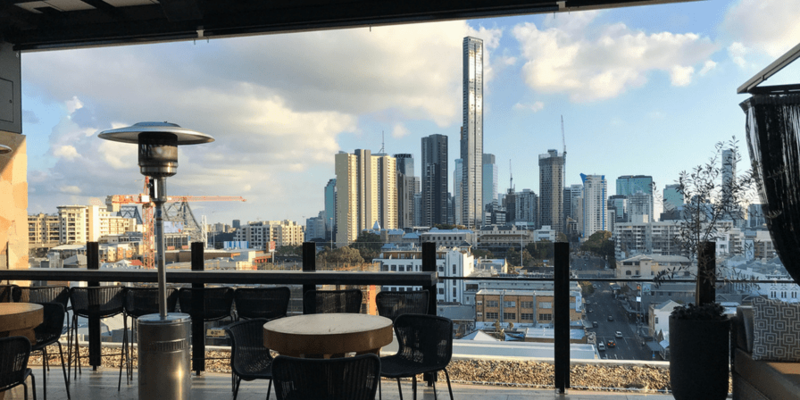 We’ve put together a list of tips for restaurants with rooftop seating that’ll ensure your restaurant with rooftop seating lights up the skyline. It doesn’t take long for sunny skies to unexpectedly turn dark and grey. While you can’t be sure how the day’s forecast will turn out, there are things you can do to prepare for inclement weather. First, consider the season and time of year: is this normally a rainy season for your area? If so, you’ll want to be cautious when accepting reservations or booking events on the rooftop. Investing in reliable umbrellas or an awning is a must with rooftop seating; not only will they come in handy when the forecast calls for rain, but they will also be a blessing on hot sunny days when guests want to stay outside but need a break from the sun’s rays. With covering available, guests will have no reason to run indoors or seek out another place to eat if the weather turns sour. Does your rooftop space sport a stellar skyline or sunset view? Don’t let it go to waste! Designate a section of the roof as a “photo-op” area; guests can take pictures for their social media accounts with the beautiful scenery in the background. In chalk, write your restaurant’s social media handle on the ground or on the wall so guests know who to tag in their posts. Providing guests with great social media content is an easy and free way to market your business; tap into the wellspring that is your guests social media connects, and you’ll reap the rewards in dollars and cents. Most restaurants with rooftops have a stairway leading to the top, but that may not be a feasible option for all of your guests – most notably elderly patrons and those with disabilities. Make sure your guests know ahead of time what the logistics are for getting to your rooftop. If there’s an elevator, make sure to let your guests know where and how to access it so you don’t end up with patrons wandering around your space looking perplexed. Bonus tip: Create tasteful, easy-to-read signs in your restaurant that direct guests to the rooftop. This is a good way to help guests get where they want to be, and to market your rooftop seating to guests in your restaurant who may not have known you had rooftop seating available. The sky’s the limit when it comes to getting creative with decorating and designing your restaurant’s rooftop. Add a slew of lush greenery for a tropical vibe, some large-bulb string lights for an easy aesthetic enhancement, or even go old-school with a popcorn machine and classic outdoor games. The more amenities and activities you offer guests, the more new guests you’re likely to snag. If you’ve got a large wall and the weather looks promising, host movie screening events; who doesn’t love an outdoor movie night in the summertime? Life is unpredictable, especially in a restaurant. If unforeseen circumstances render your restaurant’s rooftop seating unavailable, it’s important to have a backup plan in place so you don’t lose out on business. Seasoned event pros know that having a backup plan (more than one, ideally) is key to ensuring an event goes off without a hitch, no matter what unexpected factors arise. If you’re using your restaurant’s rooftop seating area for regular meal service, you’ll need to figure out an alternative area in the restaurant where guests can sit if the roof suddenly becomes unavailable mid-meal. Any reservations booked for the roof should be contacted by the manager on duty; encourage the guest to switch their reservation to another night and offer a discount or special promotion. If you’re using your rooftop seating for private functions, it’s a good idea to have an indoor function area you can transition guests to if the rooftop suddenly is no longer an option. It’s important, as a restaurateur, to cut down on the opportunities your guest has to leave or seek an alternative dining option. Always have a backup plan ready that ensures guests will be able to stay and enjoy themselves at your restaurant in the face of unforeseen circumstances, rather than having to find somewhere else to eat. Your rooftop can likely accommodate a range of party sizes. If you’re planning on allowing guests to book your restaurant’s rooftop seating for private events, have a few ready-made floor plans mocked up that illustrate what an intimate, medium, and maxed-out gathering size would look like. This helps guests get a feel for what your venue can offer for their event. When it comes to furniture, stick to outdoor or patio furniture, as it's more durable; it's also a good idea to stay away from using high-tops on a rooftop. That's a recipe for disaster. Unless you have a sizable kitchen area on the rooftop, there will likely be a lot of back and forth happening with your restaurant staff running food and drinks up to the roof. A lot of back and forth = a lot of opportunities for spills, crashes, falls, etc. If you have a bar on your rooftop, make sure the bartender has all the mixers, liquors, wines, ice, cups, and accoutrements ahead of time so a mad dash – and an untended bar– won’t be necessary. Join us at #Rooftop93 for our new #summer #menu . . . . . #homemade #popsicles #summertime #drinks #newyork #newyorkcity #rooftops #nycrooftops #views #nycviews tag a friend that'd enjoy this! If you don’t have a bar on your roof, set up an area with a fridge where you can store the most popular beer and wine selections on the menu for servers to pour and serve, as well as an ice maker to keep those drinks refreshingly cold. If you’re worried about the propensity for accidents when running food up from the kitchen, create an abbreviated menu for rooftop guests that has dishes that are easier to transport. Consider offering rooftop seating guests a buffet style meal; buffet style meals are ideal in this setting since they can stay warm with chafing dishes as long as they’re not in a breezy area. Servers with a handheld point of sale system like Toast Go™ can fire orders from the rooftop directly to the kitchen, speeding up service and minimizing the constant back and forth. A gust of wind could be disastrous to the guest experience on your restaurant’s rooftop. From knocking over a drink or sending napkins flying, to sending a backdrop or piece of decor over the edge of your building, you want to avoid windswept missteps at all costs. We recommend anchoring down any flimsy items, including seat cushions, with heavy-duty tape or string and swapping paper napkins for thicker cloth ones if you can. Some restaurants also anchor down their tables and chairs so the wind doesn't knock them over. If you’re not able to do this, keep all napkins at the bar or buffet table under a heavy-bottomed cocktail glass. Before opening your rooftop space to guests or events, double-check to see what is and isn’t covered by your on site insurance policy; reach out to your insurance rep to make sure you have a clear understanding of how your business is protected in the event something happens and whether you can legally operate a business on the roof. In many cities, zoning and licensing laws will restrict a restaurant's ability to entertain guests on the roof, so it's likely you'll need to get approved for an exemption from zoning laws and apply for special permits to be able to operate your restaurant on your roof. If you'd like to expand your restaurant to include rooftop seating, loop your restaurant's legal counsel in on the idea as soon as you start considering the option. They will be your best bet in navigating the complicated processes and language used with regard to zoning laws, licenses, and permits. If you’re worried about guests' behavior on your rooftop, post signs that outline how your restaurant is indemnified from being held at fault for consequences of reckless behavior. Relay the specifics of your restaurant’s insurance to event organizers as well. If some degree of responsibility will legally fall on the party, you can recommend they get their own one-time event insurance through their own insurance company. Depending on your rooftop layout and capacity, you may want to have an onsite security guard present to make sure everything runs smoothly on your restaurant’s rooftop. Offer guests who book your rooftop seating area for private functions the ability to pay for additional security guards to be present at their event. This is an especially good idea for rooftops with low side railings, or for a celebratory evening event that will be serving liquor — better safe than sorry! If you’d like to play music on your restaurant’s rooftop, make sure all speakers and equipment are properly secured to protect against the wind and the elements, and be sure you’re compliant with any noise ordinances your city has. We have the big screen up for the game tonight! Use these reminders as a checklist to prepare for rooftop season, ensuring that your summer is a success. What's your favorite rooftop bar & why? How are you preparing for rooftop season? Leave your thoughts in the comments below! Keep things moving on your rooftop with Toast Go – Learn more below! We're increasing our commitment to helping restaurants succeed with $250 million of new funding.